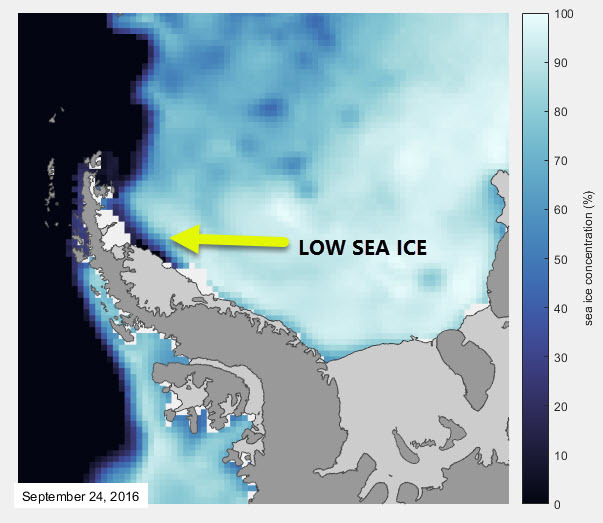 The low sea ice extent I noticed in my previous blog post about Antarctic Sound has extended southwards along the east side of the Antarctic Peninsula. The open water that shows up as black in the image above extends to at least as far south as the Antarctic Circle (66° 33′S). Open water along this part of the Antarctic Peninsula is unusual at any time of the year let alone the height of winter. The image below is from the National Snow and Ice Data Centre. It shows sea ice extent >15% with an outline of the typical extent for that day based on a 30-year (1981-2010) median (orange line). 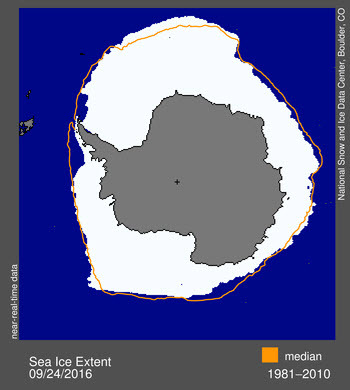 NSIDC Antarctic sea ice extent 24 September 2016 with the median extent (1981-2010) for this day. You can see how unusual this observation is, and I wrote a general post Antarctic Sea Ice Extent a while ago. 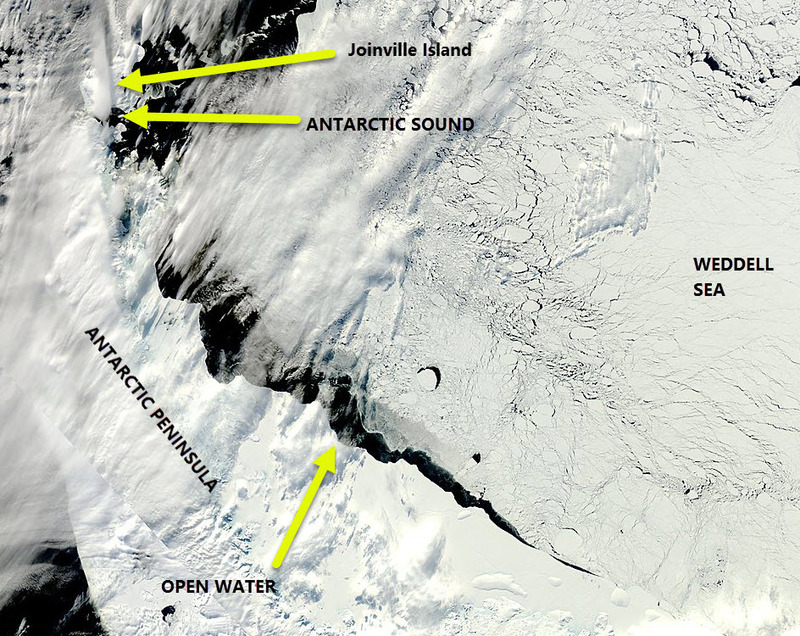 The open water is also very clear in the MODIS imagery as the black wedge between the Antarctic Peninsula, and the sea ice of the Weddell Sea. The MODIS imagery for the Antarctic Peninsula 25 September 2016. In my previous post I pointed at weather systems as likely being responsible. Now to me it looks like a large system is pushing the whole Weddell Sea sea ice to the east and away from Antarctic Peninsula. There is always some open water in the pack ice at any time of the year, but it's clear that their is a pathway south right now. I imagine it will close soon and wouldn't be keen to be on a ship in that open water heading south. What is interesting is the heat transfer from the ocean to the atmosphere that far south at this time of the year will be huge. This is what I wrote about that heat loss for the Arctic. Posted in Science. Tags: Antarctic Peninsula, MODIS, open water, satellite, sea ice, Weddell Sea on September 26, 2016 by Mark Brandon.